C.B.S.E. has introduced the novel — The Story of My Life by Helen Keller under Long Reading Text to be studied by the Class X standard students with effect from 2013-2014 session. It has been made compulsory in order to develop Reading Habit among students. 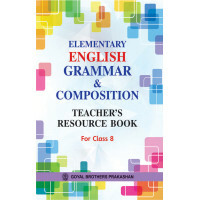 This novel has been prescribed for English Communicative and English Language and Literature Courses. Strictly as per the latest C.B.S.E. curriculum. Chapterwise Summary for quick recapitulation. Chapterwise Long Answer Questions based on theme, plot,incidents and characters.